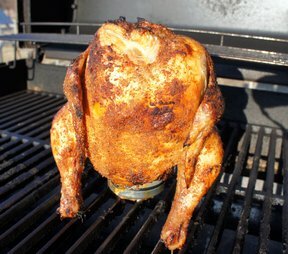 Reserve 1 tablespoon rub for the beer can; rub the remainder of the seasoning over bird, and in body cavity. This can be done up to one day ahead. Wash and dry beer can. Pour off about half the beer and set aside to enjoy later. Add reserved rub to can, and slowly rotate to mix. Set the bird on the beer can and position the legs so they support the bird. Position bird on grill being careful not to tip the bird over and spill the beer. Cook over indirect heat at medium high setting for approximately 1 1/4 hours or until a temperature of 185 is reached in the thickest part of the breast and thigh. 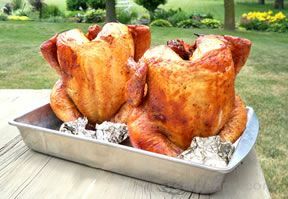 When the bird is done, remove from grill and allow to rest for 10 minutes before cutting into serving pieces.